Haworth, also known as Bronte Country after the novelist sisters, is steeped in English heritage which is the essence of our reputation as one of the top luxury accommodations Yorkshire visitors can stay at. We offer relaxation, comfort and all the amenities you could want in a traditional setting. Antique furniture combined with original architecture and attention to detail gives our luxury accommodation an unparalleled atmosphere of authentic sophistication; perfect for a short holiday, romantic breaks or a place to hold a private party. If you are looking for a hot tub hotel, we offer rooms with private patios with private Hot Tubs that can be enjoyed all year round. Gaze at the stars and sip champagne whilst bathing in an al fresco hot tub, the ultimate experience for romantic breaks. Choose from a range of rooms that have exclusive access to hot tubs one with a sauna cabin, each of which is decked, decorated and lit for romance and relaxation. We will happily do all we can to enhance your hot tub hotel experience with us with any of our special romantic extras such as; a single red rose, ‘Just Us’ surprise party, candles, flowers, chocolates and strawberries, champagne and romantic music playing when you come back from your evening meal. Or we have our traditional Afternoon Tea, just tell us what extras you would like when you make your booking. From Friday the 8th of January let us create a simply unforgettable dining experience, by our talented award winning Head Chef, Christopher Hutchinson. Our tasting menu will then be served every Friday at 7pm. £50.00pp additional £25.00 for wine pairing. Set in the heart of Bronte Country, this Victorian house has many original features and antique furniture. 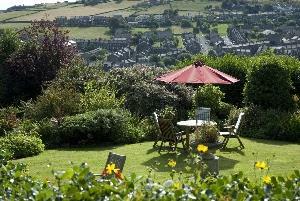 Built by the Bronte family's Dr Ingham, it has fabulous gardens, wonderful views from most of the rooms plus private parking. Michelin accredited. 5 minutes to nearest golf course, horse riding and fishing. 3 minute walk to the Bronte Parsonage Museum. Children welcome from age 10. M62 - A629 - Halifax - Haworth A1642 into Haworth, Rawdon Road, past primary school on right, take next right in to Mytholmes Lane 150 yards on the right is Ashmount. By train Leeds - Keighley - Haworth (train when running) or bus / taxi. By air Leeds Bradford 50 minutes drive. Manchester Airport 1 hour 45 minutes drive.